The combination therapies recommended by the World Health Organization for treatment of brucellosis are doxycycline plus rifampicin or doxycycline plus streptomycin. Although highly successful results have been obtained with these two regimens, relapse rates as high as 14.4%. The most effective and the least toxic chemotherapy for human brucellosis is still undetermined. The aim of the present study was to investigate the efficacy, adverse effects and cost of ofloxacin plus rifampicin therapy, and doxycycline plus rifampicin therapy and evaluate in the treatment of brucellosis. The open trial has been carried out prospectively by the two medical centers from December 1999 to December 2001 in Duzce region Turkey. The diagnosis was based on the presence of signs and symptoms compatible with brucellosis including a positive agglutination titre (≥1/160) and/or a positive culture. Doxycycline and rifampicin group consisted of 14 patients who were given doxycycline 200 mg/day plus rifampicin 600 mg/day during 45 days and this group Ofloxacin plus rifampicin group was consisted of 15 patients who were given ofloxacin 400 mg/day plus rifampicin 600 mg/day during 30 days. Regarding clinical and/or demographic characteristics no significant difference was found between two groups of patients that underwent two different therapeutic regimens. At the end of the therapy, two relapses were seen in both groups (p = 0.695). Although duration of therapy was two weeks shorter in group treated with rifampicin plus ofloxacin, the cure rate was similar in both groups of examinees. Fever dropped more rapidly in the group that treated with rifampicin plus ofloxacin, 74 ± 30 (ranges 48–216) vs. 106 ± 26 (ranges 48–262) hours (p = 0.016). Ofloxacin plus rifampicin therapy has advantages of shorter treatment duration and provided shorter course of fever with treatment than in doxycycline plus rifampicin therapy. However, cost of ofloxacin plus rifampicin treatment is higher than doxycycline plus rifampicin treatment. Because of the similar effects, adverse effects and relapses rates between two regimens, we still advice doxycycline plus rifampicin for the treatment of brucellosis for countries, which have limited resources. Brucellosis is a systemic infection caused by facultative intracellular bacteria of the genus Brucella that manifests the most commonly as fever of unknown origin. Brucellosis remains a major zoonosis worldwide and it is endemic in certain parts of Turkey. Currently, the most commonly used antibiotics in the treatment of brucellosis are tetracycline, trimethoprim-sulfamethoxazole, aminoglycosides, rifampicin, quinolones and chloramphenicol [1, 2]. These antibiotics are used alone or in combination. However, due to frequent relapses observed with monotherapy, combined therapy is recommended . Currently, the combination therapies recommended by the World Health Organization for treatment of brucellosis are doxycycline plus rifampicin or doxycycline plus streptomycin. Although highly successful results have been obtained with these two regimens, relapse rates as high as 14.4% . The most effective and the least toxic chemotherapy for human brucellosis is still undetermined . The present study was undertaken to evaluate the efficacy, safety, and cost effectiveness of doxycycline plus rifampicin regimen for 45 days compared to ofloxacin plus rifampicin regimen for 30 days for the treatment of brucellosis. This study was carried out in the Social Security Duzce Hospital and Abant Izzet Baysal University Duzce Medical School in Turkey. After obtaining informed consent, a detailed medical history was taken from each patient and complete physical examination was performed. Patients suspected to have brucella infection on the basis of clinical (fever, limb and back pains, sweating, fatigue, hepatomegaly, splenomegaly, arthritis, sacroileitis, spondylitis, orchitis and headache) and laboratory findings were hospitalized. The diagnosis was based on the presence of signs and symptoms compatible with brucellosis including a positive agglutination titre (≥1/160) and/or a positive culture . All sera obtained from the patients were examined by serial dilution (from 1:10 to 1:1280) using bacterial antigen. The antigen was obtained from the Ministry of Agriculture (Veterinary Research Institute, Pendik, Istanbul). Patients were hospitalized for at least 10 days at the beginning of treatment in order to monitor clinical response and potential side effects. The patients were assessed and laboratory tests were also performed during the therapy period in the 2nd, 4th, and 6th week of therapy. At the end of therapy, laboratory tests were reassessed at months 1, 2, 3 and as well as whenever clinical symptoms reappeared. Biphasic Castenade medium was used for blood and bone marrow cultures. Complete blood count (CBC), and routine biochemical tests, erythrocyte sedimentation rate (ESR), urine for urinalysis, and stool, urine and at least three blood cultures were determined at baseline, and all scheduled follow -up visits. Bone marrow aspirate cultures obtained three patients. Blood cultures, standard tube agglutination test, and clinical evaluations were done monthly during the first 3 months post therapy. Additional studies were performed as needed. Sample size was determined according to the patients who were admitted to the study with brucella infection in the study period. Patients who met the criteria for entry were randomly assigned to receive in a 1:1 ratio in doxycycline plus rifampicin or ofloxacin plus rifampicin group. Doxycycline plus rifampicin group had 14 patients who received doxycycline 100 mg two times daily and rifampicin 600 mg once daily for 45 days. Ofloxacin plus rifampicin group had 15 patients who received ofloxacin 400 mg once daily and rifampicin 600 mg once daily for 30 days. Exclusion criteria were history of seizure, pregnancy and age under 15 years. Between December 1999 and December 2001, 34 (24 male and 10 female) patients were recruited. 29 patients (24 male and 5 female) completed this study in the follow-up period. These criteria were carried out both groups. Four patients were excluded from doxycycline plus rifampicin group. Because they felt well, they didn't complete the therapy. One patient was excluded in the ofloxacin plus rifampicin group because he didn't want to use drugs two weeks after starting to the treatment. As a result five patients were excluded from the study (Fig. 1). Flow chart of the patients in the study. The study protocol was approved by the local ethics committee. All patients were informed about study and agreed to contribute in the study by signing informed consent. The primary end point was existence of clinical relapse. Relapse was defined as the reappearance of symptoms and sign of the disease accompanied by increasing titers of the serological tests and/or a positive culture during the follow-up period after treatment was stopped [1, 15]. The secondary end point was accepted as the duration of fever after starting treatment. Fever of patients who were started to treatment was measured by axillary route and recorded every hour until it decreased to 37°C. Duration of fever after starting treatment was compared between the two groups using non-parametric test (Mann-Whitney test). The data of the other parameters were analyzed using Fisher's exact test. We used Epi-info 6.0 (Centers for Disease Control, Atlanta) to perform the analysis and considered p < 0.05 as significant. 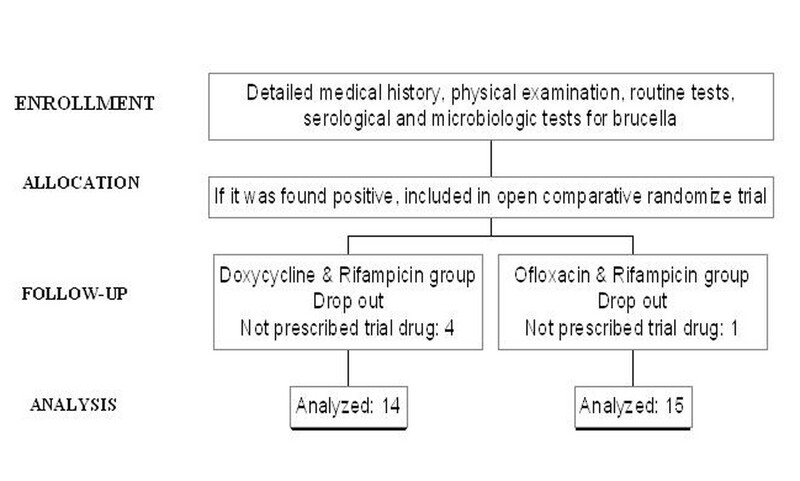 Comparisons of the clinical and demographic findings in the doxycycline plus rifampicin group and ofloxacin plus rifampicin are presented in Table 1. Doxycycline plus rifampicin group and ofloxacin plus rifampicin group were followed up after treatment 149 ± 74 days, 156 ± 15 days (mean ± SD) respectively. After starting treatment, fever disappeared within an average of 106 ± 26 (ranges 48–262) hours in doxycycline plus rifampicin group and 74 ± 30 (ranges 48–216) hours for ofloxacin plus rifampicin group (p = 0.016, CI 95%: 21.21–41.06). Nausea and vomiting were registered in three patients in doxycycline plus rifampicin group and in one patient in ofloxacin plus rifampicin group. Diarrhea was seen in one patient in doxycycline plus rifampicin group and two patients in ofloxacin plus rifampicin group. After the failure of the study regimens, these patients were given doxycycline 100 mg two times daily for 6 weeks plus streptomycin 1 g/day for 3 weeks. Human brucellosis has a serious medical impact worldwide, and its eradication poses major difficulties . In Turkey, annually reporting cases of brucella are approximately 15.000 according to the data of the Ministry of Health Turkey in 2001 year. However it is believed that the real number of the cases is at least 50.000–100.000 per year, when the unreported and subclinical cases are taken into account. For this reason, brucellosis is an important problem in our country . Treatment of brucellosis must effectively control acute illness and prevent complications and relapse. The regimen of choice and duration of antimicrobial therapy should be based on the presence of focal disease and underlying conditions that contraindicate certain specific antibiotics. Selection of therapeutic regimen and duration of therapy depend on clinical presentation of the disease, as well as on underlying diseases and/or conditions that could be contraindication for some antimicrobial agents. Tetracyclines are generally contraindicated for pregnant patients and children under 8 years of age. Rifampicin 900 mg once daily for 6 weeks is considered as a drug of choice for treating brucellosis in pregnant women. The preferred regimen in children under 8 years of age is rifampicin with cotrimoxazole (trimethoprim-sulfamethoxazole) for 45 days. Appropriate antimicrobial therapy and duration of the treatment of human brucellosis will reduce morbidity, prevent complications, and diminish relapses . 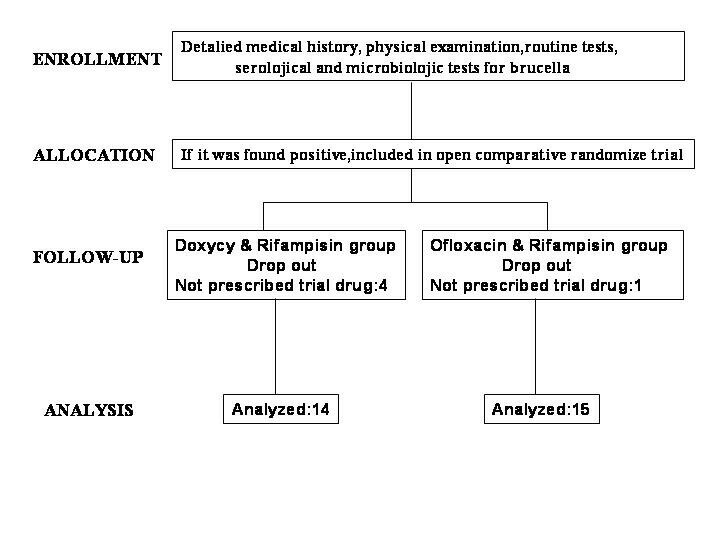 In the present study, doxycycline plus rifampicin therapy for 45 days was compared with ofloxacin plus rifampicin therapy for 30 days in patients with brucellosis. Relapses were seen in each group. There was no significant difference between the two regimens for relapse rates (p > 0.05). After starting treatment, fever disappeared within an average of 106 ± 26 (ranges 48–262) hours in doxycycline plus rifampicin group and 74 ± 30 (ranges 48–216) hours for ofloxacin plus rifampicin group (p = 0.016). In the present study, the average number of the days without fever was higher in ofloxacin plus rifampicin group than doxycycline plus rifampicin group. Ciprofloxacin and ofloxacin are particularly active in vitro against brucella infections . However, only a limited number of clinical studies have been conducted to test the new quinolones against this organism [9, 10, 15]. In contrast to the results of in vitro studies, however, the findings in clinical studies with floroquinolones have been controversial. Monotherapy with these agents showed high relapse rates [11, 12]. Doganay et al. in their clinical study with 14 patients (one subacute and 13 acute infections) tested ciprofloxacin 500 mg thrice daily for 3–6 weeks as monotherapy for the treatment of brucellosis. All patients, including those with complications, showed clinical improvement at the end of ciprofloxacin therapy. However three patients relapsed at week 4, week 5, and month 4, after cessation of therapy, resulting in a relapse rate of 21%. Lang et al. reported high relapse rate of 66% among patients who received ciprofloxacin as monotherapy. Al-Sibai et al. administrated 750 mg ciprofloxacin thrice daily for 6–8 weeks their 16 patients (9 of whom had complication). Three patients relapsed 8–12 weeks after end of the therapy, and the resulting relapse rate was reported as 25%. Patients treated with a single agent such as tetracycline, rifampicin or ciprofloxacin have a 10–40 percent chance of suffering a relapse therefore, many authorites suggest that combination therapy is should be given, and quinolones monotherapy should not be used [3, 12]. In the study, two regimens were compared for the side effects and costs. Nausea was seen in three of 14 patients who were adminestered doxycycline plus rifampicin and one of 15 patients who were administered ofloxacin plus rifampicin. Diarrhea was seen in one of 14 patients who were adminestered doxycycline plus rifampicin and in two of 15 patients who were administered ofloxacin plus rifampicin. These results suggested that there were similar side effects with both regimens. Cost of ofloxacin plus rifampicin treatment during 30 days is 45 $ whereas cost of doxycycline plus rifampicin during 45 days is 25$. In point of cost effectiveness, doxycycline plus rifampicin treatment is approximately twice superior to ofloxacin plus rifampicin. This is an important difference especially in countries with limited resources. In the present study, we administered ofloxacin plus rifampicin to patients with brucellosis for 30 days, which was approximately two weeks shorter course than the standard doxycycline plus rifampicin regimen. No significant difference in success rates was observed between the two groups. The therapies that cause disappearance of the symptoms in short time increase the compliance of the patients . Agalar et al. compared doxycycline plus rifampicin for 45 days versus ciprofloxacin plus rifampicin for 4 weeks. In one-year follow-up they reported relapses rates were 15% and 10% for doxycycline plus rifampicin therapy and ciprofloxacin plus rifampicin therapy, respectively. They reported that the ciprofloxacin plus rifampicin combination was as effective as the doxycycline plus rifampicin combination and patient compliance was superior the ciprofloxacin plus rifampicin combination than the doxycycline plus rifampicin combination. Similarly, in the present study, that the completion of treatment 15 days ago and early improvement of fever in patients who administered ofloxacin plus rifampisin therapy increased satisfaction of the patients such as the adaptation of the therapy. It is important to consider the limitations of this study. In the present study, 14 cases were evaluated in doxycycline plus rifampicin group and 15 in ofloxacin and rifampicin group. In order to detect a minimum difference of 14% between two groups of patients, the beta error would be 0.52. On the other hand, a true difference between regimens (i.e., alpha = 0.05 and beta = 0.20) would require 26 patients to be allocated to each of the treatment groups. Our study group was small and thus might lack power to distinguish a true difference between the treated group and the control group. We think that further studies, especially larger well-designed ones, are needed to therapy for brucella infection. On the basis of our results, we conclude that ofloxacin plus rifampicin for the treatment of human brucellosis is as effective as the standard doxycycline plus rifampicin regimen. Although, ofloxacin plus rifampicin decreased the duration of the therapy and provided shorter course of fever, however these superiorities are not sufficient for declaring this treatment as treatment of choice. Difference in costs between two regimens in our country is significant and approximately two fold higher for ofloxacin plus rifampicin treatment. Because of similar effects, adverse effects and relapses rates between two regimens, we still advice doxycycline and rifampicin regimen in treatment of brucellosis especially for countries with limited resources. All authors read and approved the final manuscript and contributed equally to the manuscript. DK: Literature search and review, drafting original article. OK and I Sencan: Patient management, article conception and critical, extensive revision of article for important intellectual content, I Sahin: microbiological procedures and statically analysis.